Third generation “fixed” or “station-based” bikeshare and “flexible” or “dockless” bikeshare both started around the same time around the dawn of the new millennium. Clear Channel’s SmartBike and Deutsche Bahn’s Call a Bike are two of the oldest station-based and dockless systems, respectively. Both fixed and flexible bikeshare have their own unique set of benefits and detriments however it’s time to hybridize them to a greater extent than has happened at the present in order to achieve the benefits of both while lessening the detriments of each. The benefits of fixed bikeshare are that it: 1) provides order in an urban environment as the station and its bikes use a defined space, 2) provides the customer a set location from which to rent a bike. In an urban environment where every square meter of space is spoken for, a fixed system ensures formality of the bikes being parked as was intended in an orderly way that doesn’t negatively impact other street users. Additionally, as we are creatures of habit, starting off one’s morning commute in the same manner and location each day provides a level of comfort for a customer, assuming that bikes are available. However, issues with fixed bikeshare are that it’s expensive for the system owner to purchase a station as they can easily cost $50,000 USD. Additionally, finding sufficient space for a 50’ x 6’ station, for example, and an adjacent site from which to rebalance it can be time-consuming to obtain necessary approvals and difficult to find a big enough area in an urban environment. The benefits of flexible bikeshare are: 1) the bikes don’t require the same level of investment as does station infrastructure, and 2) servicing less dense areas -- where usage is lower and distances are greater – is comparatively quite economical. However, a major issue with flexible bikeshare is that the bikes sometimes aren’t parked well by the public in denser neighborhoods, leading to obstacles on sidewalks and streets as well as using up valuable public space. Therefore, hybrid fixed/flexible systems with stations in denser neighborhoods but not in less dense areas should be made commonplace by the cities and counties who own bikeshare systems and the bike and station vendors they work with. This would allow for a more economical transit service to implement and operate along with more orderly placement of bikes – the latter of which has been a great concern to the public. An additional benefit is that overflow parking can easily be created by customers at fixed systems by the flexible systems by locking the flexible bikes either to adjacent inverted U bike racks as nextbike does in Budapest, or to the docked bikes themselves as Smoove does in Paris. This decreases the need for rebalancing the full stations as additional limited capacity can be created. There are a few vendors as I’ve mentioned above that have seen the light and necessity of hybridizing, including nextbike (below), Call a Bike, and Jump. Smoove is to have this in Paris in the future. It would be wise for more vendors to follow this path for the benefit of bikeshare customers around the world who rely on bikeshare to move around their region. 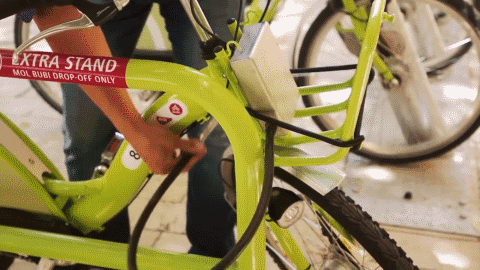 The dawn of pedelecs has arrived into bikeshare and flexible pedelecs are going to need stations that are hard-wired to an electrical source to recharge. Manual swapping of batteries for a large fleet would be a grand task and is merely a short-term solution. With hybridization of fixed and flexible technologies, the best of both worlds unite. There will be roadblocks, such as competition between vendors and lack of cooperation between municipalities and operators but hybridization will happen because it’s too good of an idea to not.